Serbian songwriting/production team. From 1998 to present, Atelje Trag composed, arranged and produced numerous hits for bestselling artists from Serbia and region. 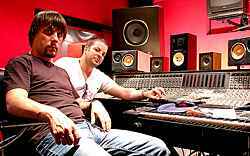 In 2006. they opened the doors of their state of the art studio facility called ATG Recording Studio (a branch of Atelje Trag Group DOO). During 2010. they spread their business to Spain and the United States, collaborating mostly with signed hip hop artists.